[AUTO]:Forerunner (When a unit of the same clan rides this unit, you may call this unit to (RC)) [AUTO](RC) Generation Break 1 (This ability is active if you have one or more face up G units in total on your (VC) or G zone): At the beginning of your main phase, choose one of your other units, and this unit will be regarded as a unit with the same card name until end of turn. 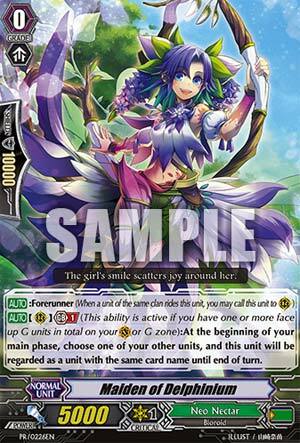 An alternative starting Vanguard in G Neo Nectar. As her GB1 skill, when your Main Phase starts, ahe copies the name of one of your rear-guards until the end of the turn. Well, plus-side? Works as a way to get power in conjunction with Pia and Jingle Flower Dragon? The main problem however is that Oz can fetch an actual copy of Pia from the deck so early numbers with cards such as Multivitamin Dragon go further. Otherwise there is not much of a way to lose Delphy without a minus to yourself. So Oz is probably going to work out as the slightly better choice since this doesn't have a whole lot of synergy with the early column game and she requires a good board for her to copy immediately, unlike the less unwieldy Oz. Otherwise, this is probably the better starter to run in decks that can gather a board earlier than this, like a Maiden of Rambling Rose deck. Not suggesting that's competitive mind you but it's a thought. Oh look, they're not ALL Grade 1 units. Hooray! Anyway, here's a Forerunner for Neo Nectars, at GB1, this changes its name to be the same as another one of your units that you have in play at the start of your main phase. ...Remember what I said with Blaster Rapier Laura? The name means more than the skill in this game at times, and this helps G-Nectars out tremendously, since they need to have multiple units with the same name to do stuff. So, can I recommend this? Yeah, yeah I can. I'm not a big Nectar player, so I can't say what this can do completely, but I'm sure that you can figure out what this can work with really easily if you play the deck.